Oil stocks are under pressure this morning, there’s a big OPEC meeting tomorrow that will probably dictate the short-term movement of oil stocks. Market continues to be extended by many measures, that at times means something other times it doesn’t. The longer your time frame the more irrelevant these short-term measures are. One interesting breadth measure that confirms that we are extended is Pradeep Bonde (Stockbee) breadth measure of how many stocks are up +50% or more in the last month. That number is now at 35, typically above 20 signifies a hot market and this when momentum starts to wane. Do you take the trades at regular size and disregard the breadth numbers? Do you reduce size to take into account the breadth numbers? Or do you not take any trades until we consolidate further? Fact is, we won’t know what is the correct thing to do until after the fact. 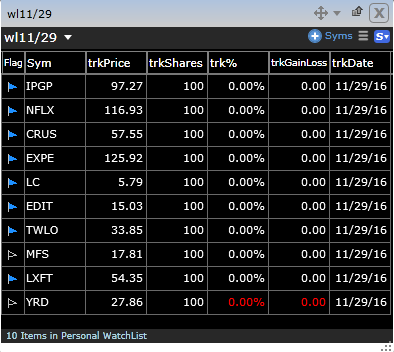 Below are the stocks on my watchlist today that I have an interest in on the long side if and only if they go through yesterday’s high.